A neat evergreen shrub with a long flowering period, Escallonia rubra var. macrantha makes an ideal informal hedging plant. 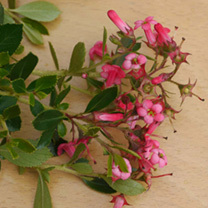 Rose-red, tubular flowers appear from early summer to early autumn against a backdrop of dark green glossy leaves. Plant in a moist, well drained soil, in sun or partial shade. Height 200-250cm.